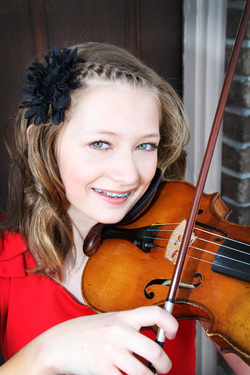 McCall Andersen, 12 years old, began her violin training with Debora Moench at the age of 3. since the age of 6, She has loved being a member of Rocky Mountain Strings, a violin performing group directed by Deborah Moench and Ramona Stirling. With this group she has traveled to Argentina, (2008) along with Belgium and France (2011) attending workshops and delighting audiences. At the age of 8, she was invited to join the Gifted Music School Orchestra under the direction of Eugene Watanabe and is currently a student in their full-scholarship program. McCall has also received chamber coaching at the GMS by Dr. Koji Atwood and Eugene Watanabe. The Gifted Music School Orchestra’s hard work and dedication awarded them a top spot on the nationally broadcasted radio program, “From The Top” in October, 2009 and recently an audition with the TV program, “America’s Got Talent”. McCall was selected to participate in North and South America’s Suzuki Association of the Americas Youth Orchestra in Minneapolis in 2008, 2010 and in 2012 as the assistant concert master. Other honors include nine consecutive superior ratings in violin performance from the National Federation of Music Clubs and four first place (2012, 2012, 2010, 2009) and one second place (20008) earnings in her division in the American String Teachers Association competition. In 2012, she was a 2nd place winner in the Utah Music Teachers Association competition in the Elementary/Junior Division and earlier this year, she was a finalist in the Utah Chamber Artist competition in Salt Lake City. In 2010 and 2012, she was a finalist in the Utah Symphony Salute to Youth competition and in 2012 was selected to play for the “Vivace” Concert held at the Covey Center, in Provo, Utah, featuring outstanding young musicians in Utah. In addition to the Covey Center, McCall has had the opportunity to perform in many different venues, including the city plaza in Bruge, Belgium, recital halls in LobbyFest at Abravenal Hall in Salt Lake City. After 5 years of home school, she is enjoying her first year of public school at the Promontory School of Expeditionary Learning in Perry, Utah. McCall also spends her time reading, taking care of her animals, listening to music, participating in any type of physical activity (especially volleyball and snow skiing) and being with her friends and family.